I blogged shortly after the budget was announced and provided some analysis on key priority areas of funding for actions addressing climate change; you can find my blog here. Will this budget see Canada prioritize green infrastructure spending? Will this budget decrease the gap between spending on defence and the environment? There is little to no funding for public transit outside of above the gas tax funding. Affordable and accessible public transit is a critical area to fund. Passenger cars and trucks account for approximately 12% of Canada’s annual greenhouse gas emissions. 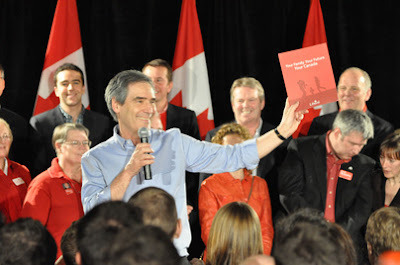 You can read the Green Budget Coalition’s analysis of Budget 2011 which highlights a couple of other programs directed at environmental priorities. The funding for the EcoENERGY Renewable Power Program, a critical federal program supporting renewable energy, was indeed, not renewed. The Council of Canadians issued a media release today indicating that, for the cost of 10 fighter jets, 1 million homes could be powered by clean electricity. When you take the maintenance costs of these fighter jets into consideration, all you need is 3. This is based on the $1.4 billion that was allotted to this important program which aimed to produce 14.3 terrawatt hours of new electricity from renewable energy sources, enough electricity to power about one million homes. Overall, the gap between spending on defence and the environment remains significant. The CCPA reports that $22.3 billion will be spent on military forces in the fiscal year of 2010-2011. Spending on the environment, as reported in my earlier blog, did decrease overall. The ratio last year between defence spending and Environment Canada program spending was 20 to 1. Will the Canadian government continue to fund false solutions to the climate crisis? As argued earlier, nuclear energy is a false solution to the climate crisis. Budget 2011 provided Atomic Energy of Canada Limited (AECL) and additional $405million in 2011-2012 to “cover anticipated commercial losses and support the corporation’s operations.” The budget also provides $4 million over 3 years to Industry Canada’s Federal Economic Development Initiative in Northern Ontario, to support the construction of a cyclotron for the production of medical isotopes. Instead of removing subsidies to the mining sector, Budget 2011 includes an extension for the Mineral Explorat Tax Credit, at a cost of $90 million net revenue reduction over 2011-2013. This will help corporations reduce their tax expenses associated with exploration activities. The Canadian mining sector includes industries that help fuel our ongoing fossil fuel addiction including coal mining, fracking for unconventional natural gas as well as uranium mining. You can read more about the incentives for mining and how this could be shifted from extraction to recycling in page 24 of the Green Budget Coalition’s 2011 document. You can also read the CCPA’s Budget 2011 analysis here. “Ramping up investments in clean energy and efficiency, putting a cap on industrial greenhouse gas pollution, enforcing the west-coast oil tanker ban, and a faster phase-out of subsidies to big oil would all be important steps towards a cleaner future for all Canadians. We are glad to see that they are part of the Liberal platform. We are especially encouraged by the proposal to indefinitely support home-retrofits for energy efficiency and restore investment in renewable energy that has largely disappeared at the federal level in recent years. However, the Liberals missed an opportunity to put forward a strategy for sustainable transportation. We had also hoped to see more aggressive steps away from our dependence on dirty oil and the tar sands, and a more assertive phase-out of subsidies to big oil. The Liberal platform plans to accelerate a phase-out already underway, but does not go far enough towards ending the $1.4 billion in subsidies currently handed out each year. The platform also does not address Canada’s fair share of money to support poorer countries as they adapt to the impacts of climate change. I read this item looking for a review of the Liberal Party platform, as the title promised, but it doesn’t even mention the Liberals. It’s all about the federal government’s budget, and the last time I checked it was the Conservatives who were in government.